Here is my April online income report. I am sharing how I make money online from my blog and businesses for April 2018. I'm really excited to share my results with you! April was one of those months that involved a lot of work and included a lot of emotion, ha! While many income reports tend to stick to the facts, I like to include the personal aspect of what it's like to work and report online income reports. It was a hard but rewarding month. I worked full time hours during the work week and put in some overtime since it was the launch of Become a Pinterest VA TODAY!. It was also the BEST month of earning income online since I started writing blog income reports back in 2015, mostly due to the course launch. However you found this blog post, I am glad you are here. It's a milestone income report for me to write, as you'll see below. My first income report is still incredibly relevant! If you are a new blogger, you can read my first income report to learn how I can make money online. I have now been publishing income reports for almost three years. Time is flying by and I still think it's crazy that I am doing this! Since I started blogging and reporting my income reports, my income has overall steadily grown from the very beginning. I'm at an exciting point with my income reports because I can look back at 2015, 2016 and 2017 and compare how much my income and expenses have changed. 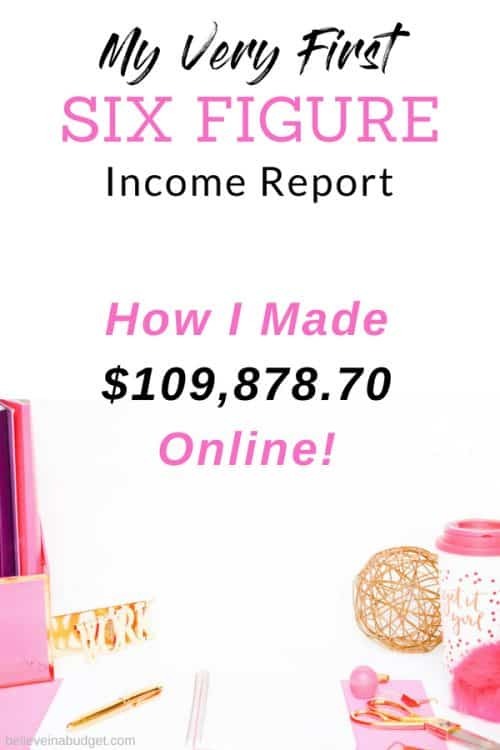 By going through all of my online income reports to see what worked, what stressed me out and what big decisions I was making at the time has been HUGE for me. This blog is like an online data diary for me, so I'm really glad I have been documenting everything for so long! Today my income primarily comes from affiliate income and my own products and courses. It wasn't an easy shift; it took almost an entire year to shift my focus and accomplish this. I'm really glad I documented my journey though, because readers ask me about this all the time. 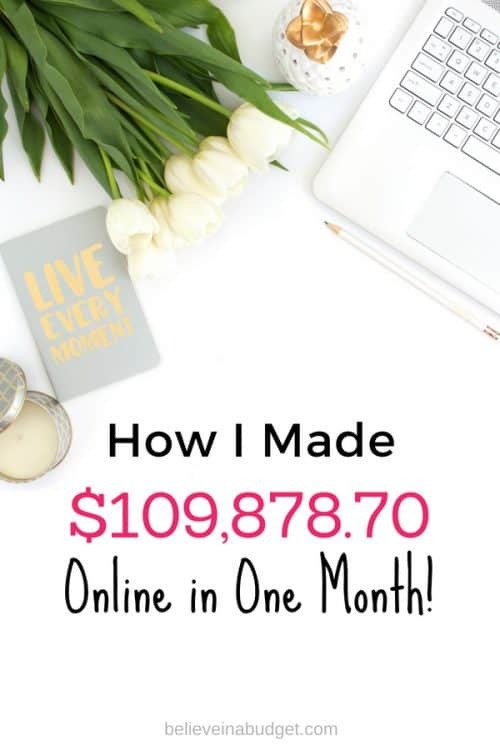 Even though we had our first six figure launch in April, this does not include any income from the payment plan for Become a Pinterest VA TODAY!. I'm also not sharing the exact amount we made from the course – my partner doesn't share income reports, so out of privacy, I keep some numbers private. Like all income reports, I lump all my courses and products into one number anyways! One of the biggest things I've noticed with my online income report is how much my income varies with affiliate income and course launch income when there is a launch. When we are not in launch mode, I tend to focus on affiliate income, which can be a large part of my monthly income. I would love to be able to do well in both areas at the same time! I started my blog in 2015. I thought it would be fun to look back at how much I made in April from previous years. This growth is just crazy! Can you imagine where you could be in 1 year, 2 years or 3 years from now? I had NO IDEA what to expect from blogging and my online biz, so looking at the chart above makes me feel really good. I would recommend doing this if you feel confident about your purchase. I feel confident about most of the tools I'm using, but it took me over two years to feel like this with certain companies! PostPlanner – how I schedule my social media posts to Facebook! I set aside money each month that go towards my annual expenses. That way when an annual payment is due, I already have the funds set aside. Having a buffer for my business is really helpful! This allows me to be financially ready when payments are due without having to take money from that current month's income. Finally, this doesn't include things like health insurance or taxes. I was putting 30% aside each month, but now I'm adjusted that to between 30-35% moving forward to account for buffering my business savings account. I also have to plan for things like savings, retirement, my HSA account, etc. We had our first six figure launch! I might write more about this in a different blog post, but April was our first official launch of the year for Become a Pinterest VA TODAY!. We have been hard at work, which resulted in a six figure launch. Launching a course is a lot of work, and I'm excited for the course to go evergreen in the fall. Become a Pinterest VA TODAY! has helped so many people transition into new side hustles and even careers as a Pinterest virtual assistant. As this is how I got my start in the online world, it's been super exciting to come full circle and now teach others my skill set. It's a great feeling being able to work online from anywhere, and a job as a Pinterest VA is one of the most coveted online jobs around. This course (along with all the products from our Pinterest VA shop) is a totally separate business from Believe In A Budget. Ever since I started my blog and to this day, my main source of traffic is still Pinterest, followed by Google and then Facebook! Pinterest allows me to earn a great living online. If you want to learn how to use Pinterest AND start a $500-$1,000 per month side hustle, check out How to Become a Pinterest VA TODAY! If I could summarize my entire month in one word, it would be…tired! I worked a ton. This blog keeps me busy, as does the prep-work, course launch and follow-up with students. Both of these businesses keep me busy full time. I generally work Monday through Friday and hover around a full, 40 hour week combined between both companies. With the launch, I added in some weekend work so I wouldn't fall behind and because of the demands of the course! I also worked on setting up my new LLC company for my secret side-hustle project I've been working on since the start of the year. This means I will have three businesses to run and operate! Setting up and running a business is not that hard. But with three businesses, I have to make sure I am 100% on top of my game. This means keeping everything separate and managing all the various bank accounts, VA help, emails, schedules and more. I'm pretty organized in general, but sometimes it can get overwhelming. Fortunately, having a partner like Gina really makes working together on the Pinterest VA business less stressful because there are two of us. We also have a lot of ideas, which ends up being more work for us as well 😅. With the new secret-side hustle business, I've had to be really intentional with my time and schedule. For the most part, as I mentioned above, I try not to work on weekends. I've found that it's much better for my mental well being to take time off and disconnect from being online. I'm not going to lie though; that's hard to do! With this new project, I've been working early in the day or else late at night, which has cut into my sleep schedule. I'm tired, but it's definitely worth it. I'm excited about this new business and I can't wait to share it with you! 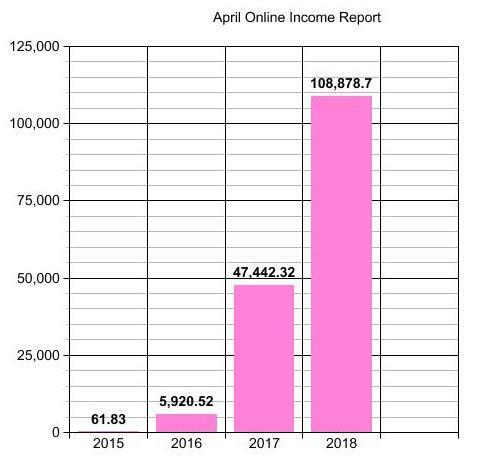 I hope you enjoyed reading April's online income report!